In previous posts, I described how rural women interact with the environment in different ways than men and that women are often absent or underrepresented in decision-making at both the local and international level. Gender mainstreaming is an approach in development work that accounts for women’s unique experiences, needs, interests and challenges in program and policy design, implementation, monitoring and evaluation. After all, how can any policy or program be effective if it ignores half of its target population? A principle part of my work in Rajasthan is to assess rural indigenous communities’ awareness of ENGO (environmental NGOs) and government supported and sponsored environmental rights and projects, such as their right of access to forests, farming assistance programs, irrigation system installation, etc. Disseminating information in rural Indian communities is exceedingly challenging because of poor communication networks, geographic isolation, migration, social stratification and a diversity of languages. The household interviews we conducted revealed that women, regardless of social status or education level, were overwhelmingly unaware of environmental rights, programs and projects. ENGOs, the government and other stakeholders need to develop awareness campaigns that are gender-sensitive to ensure that women are informed of opportunities to improve their livelihoods. A gender-sensitive awareness campaign first requires an understanding of the target female population, including demographic factors such as caste, literacy rate, language, occupation, etc. 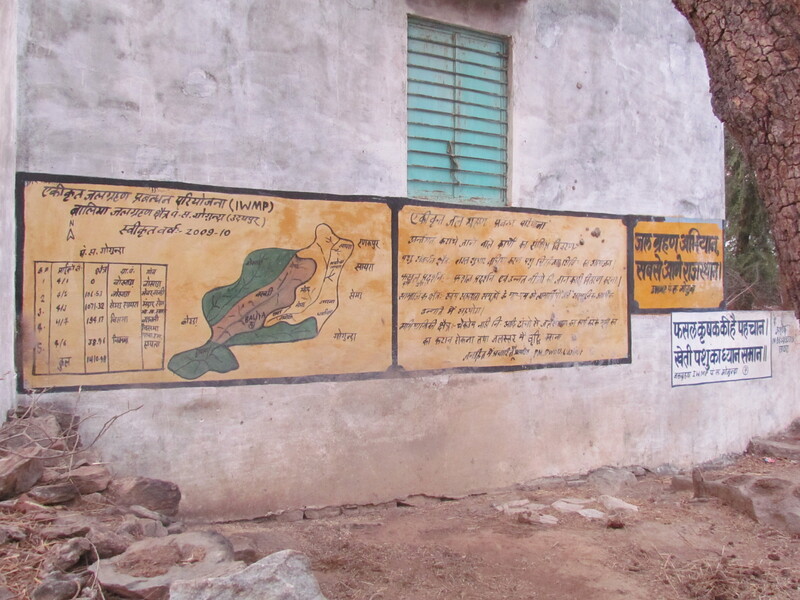 Indian political parties and ENGOs often commission murals in public spaces to convey information to illiterate populations. In addition to written information, the murals communicate regionally, culturally or politically significant symbols to illiterate viewers. Rajasthan’s census reports a 52 percent literacy rate among women, but based on our interviews, we estimate that the literacy rate among indigenous women in the two villages we work in is much lower. Mural placement is key: women will probably not be aware of a mural advertising a maternal health program if it is painted outside a tea shop frequented only by men. Through our research, we identified the location with the most potential impact: the concrete bases surrounding wells and hand pumps. Women visit the wells and hand pumps four or more times a day, spending approximately three hours daily filling clay matkas with cold water. In another example, an ENGO in Rajasthan hosts an annual workshop on World Environment Day, with the purpose of educating local farming households on various environmental and agricultural issues. The ENGO provides an honorarium for attendees’ travel costs and reports adequate attendance. In the village of Haila, we met with three women who attended the workshop last June. The workshop was hosted in Hindi, but many women only speak the local language Mewari, having never attended school to learn Hindi. The women were given pamphlets to distribute within their communities after the workshop, but they admitted to disposing of the pamphlets because they could not understand their purpose or importance. The women’s limited experience at the workshop stresses the dire need for ENGO programs and policies to be gender-sensitive. Certainly, developing gender-sensitive policies and programs is challenging. Women are not a monolithic population in India, and policies and programs must still consider class, caste, religion, migrant worker status and indigeneity. Gender mainstreaming is a key strategy in promoting worldwide gender equality, results in more comprehensive policy and legislation development and ultimately more effective governance. Entrepreneurial Ego: Does it Inhibit or Accelerate Success?